The story opens in 1906 in New Rochelle, New York, at the home of an affluent American family. One lazy Sunday afternoon, the famous escape artist Harry Houdini swerves his car into a telephone pole outside their house. And almost magically, the line between fantasy and historical fact, between real and imaginary characters, disappears. 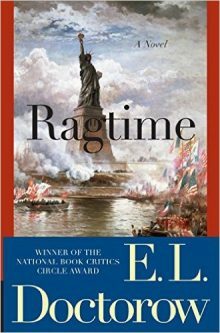 Henry Ford, Emma Goldman, J. P. Morgan, Evelyn Nesbit, Sigmund Freud, and Emiliano Zapata slip in and out of the tale, crossing paths with Doctorow’s imagined family and other fictional characters, including an immigrant peddler and a ragtime musician from Harlem whose insistence on a point of justice drives him to revolutionary violence.